Apple has released the iOS 7.1 beta 3 download to developers after a long period of silence. The last iOS 7.1 beta 2 rolled out was in mid-December to developers, and introduced many new features for iOS 7.x running devices across different variations. However, the latest iOS 7.1 beta 3 download is now available for developers in iOS Developer Center and as well as an OTA update for iOS 7.1 beta running devices. 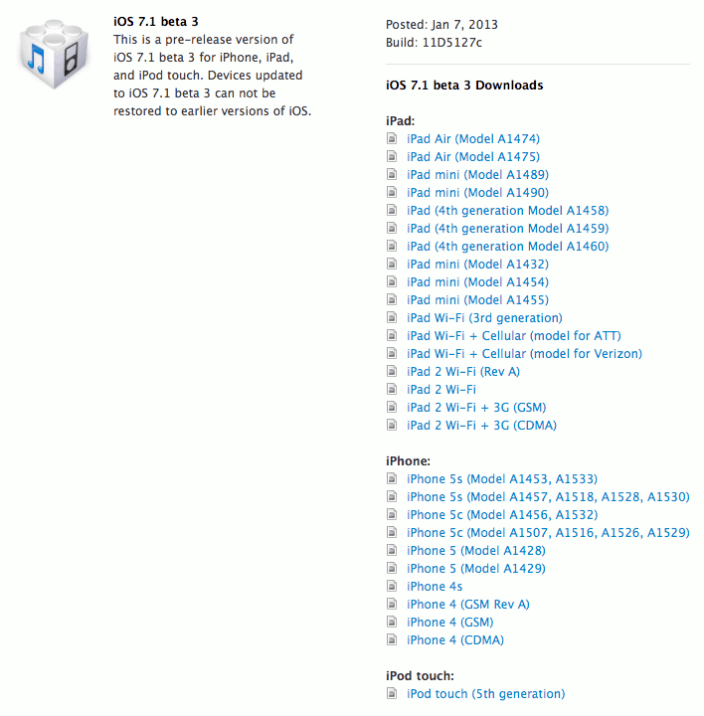 Latest iOS 7.1 beta 3 download brings major changes in iOS core system, and bug fixes over iOS 7.1 beta 2 running devices. Furthermore, we learned that Apple is not going to launch iOS 7.1 to public before March, 2014. There was a report that Apple is working with auto-mobile partners for iOS in Car system, and iOS 7.1 to feature the full compatibility of this new function. Therefore, there will be a delay in the launch of iOS 7.1 in public. iOS 7.1 beta download links are coming shortly on our download page here, and you can install iOS 7.x beta on your device with following our easy guide. The iOS 7.1 beta 3 brings major UI changes for iOS 7 Keyboard, Phone dialer interface, and as well as for power-off interface. In the meantime, we are tracking the latest changes of iOS 7.1 beta 3 for iPhone and iPad devices. You can bookmark the page to get iOS 7.1 beta 3 download links.